I look at a tomato...should I slice it or cut into wedges. She probably looked at a tomato and thought, "Shall I make pumpkin chutney, moussaka, ratatouille, salsa, gazpacho, menerboise or minestra?" 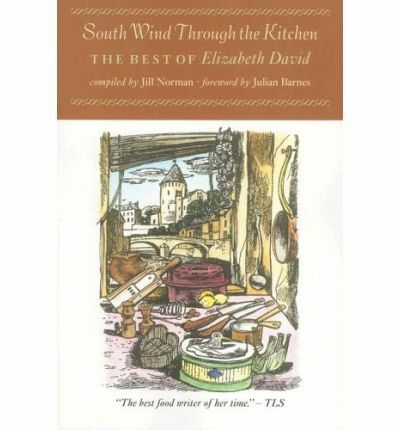 Elizabeth David changed the way we cook, and how we think and write about food. Her first two books, and French Country Cooking, were a celebration of everything fresh, tasty, simple, and delightful, and they struck a decisive one-two punch against the mingy spirit of British postwar cooking. David's wit and love of pleasure, her appeal to the senses and the imagination--not to mention her delicious recipes--sparked an international revolution in taste: boiled carrots and canned ham suddenly gave way to olive oil and sea salt, sprigs of rosemary and whole basil leaves, seasonal produce and fresh pasta. Here was something new in the cold, gray world: a food writer who was stimulating, opinionated, informative, and funny, a wonderful companion in both the library and the kitchen.